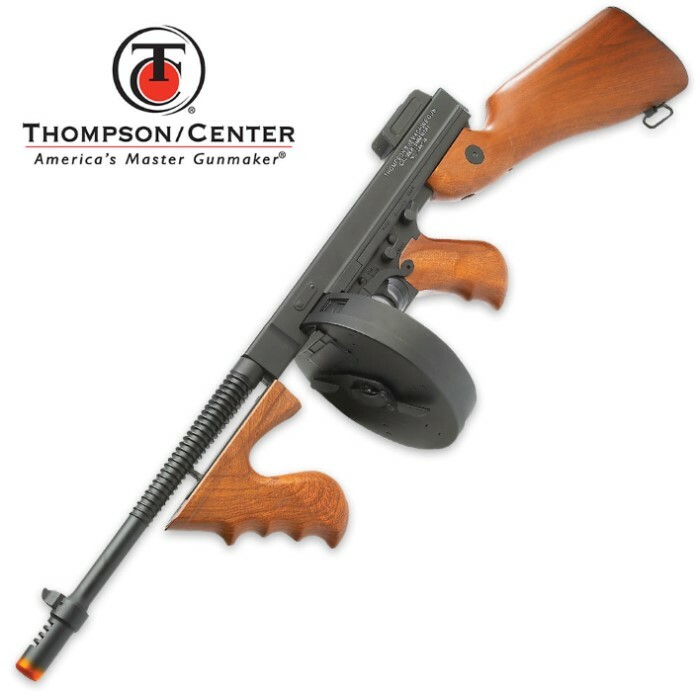 Thompson Chicago Typewriter Airsoft Rifle | BUDK.com - Knives & Swords At The Lowest Prices! Favored by every mobster and gangster in the early 1900s, the infamous Chicago Typewriter was known for its firepower and portability. This replica is true to the original and comes complete with a fore-grip, finned barrel and Thompson drum magazine. It is constructed of replica wood and full metal with a unique serial number and original logs and trademarks. It is a high-powered automatic electric gun that will shoot BBs at 370 fps from the 450 drum magazine. It also has a two-way adjustable rear sight for windage and elevation. It is 32” in length and weights 7lbs.